Hyderabad: They are not mere concrete structures any more. Though, the basic purpose of flyovers or underpasses is to facilitate free flow of traffic and ease congestion, these structures are now becoming platforms for promotion of art, culture and essence of a city. And, Hyderabad is no exception. Take the Chintalkunta underpass or the Ayyappa Society underpass, the sidewalls of which are beautifully painted depicting the wildlife and rural atmosphere of the State. Similarly, the flyovers, including Hitec City, Punjagutta, Greenlands junction and others are all decked up with murals and aptly supported with greenery and ornamental saplings. 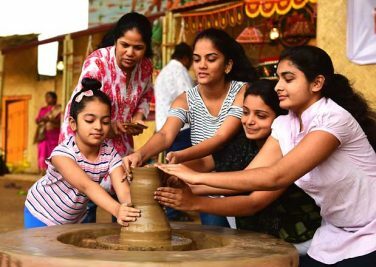 These efforts put in by Greater Hyderabad Municipal Corporation and other civic bodies to decorate the concrete structures, which earlier were reduced as a means to ease traffic congestion, are being welcomed by the citizens and landscape architects. Decking up flyovers, underpasses or concrete structures with colourful paintings, murals, greenery and other paraphernalia defines the essence of a city. Jaipur is called Pink City and Jaisalmer is known for extensive use of yellow colour, such practices add a new tinge of ambience in the city. 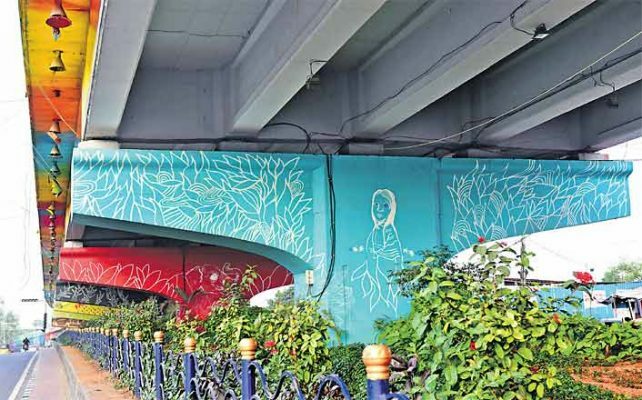 Likewise, the flyovers in Hyderabad are now being embellished with greenery and murals, says Dr. Sridevi Rao, vice-president of Indian Society of Landscape Architects (ISOLA). It is not just flyovers and others, the series of Hyderabad Metro Rail pillars which now depict the pictures of writers, freedom fighters, stalwarts, legends, State Bird (Pala Pitta), help the present generation to learn about their history. They also aid in promotion of local tourism. In addition to beautification or promotion of art, there is other side to the coin. 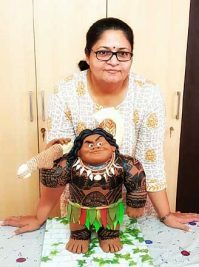 The vertical gardens, which are now regular features at all flyovers and junctions, help in reducing the day temperature as well, points out Sridevi Rao.